Nothing seems to have amused readers of The New York Times this week more than correspondent Robert Pear's news story on Tuesday about members of Congress possibly legislating themselves and their staffs out of health insurance. As we reported last week, this sloppily drafted bill never was intended to become final law but was merely a Christmas tree to get 60 votes (on Christmas Eve) in the Senate to advance the legislative process. But Democratic leaders concluded that passing the Senate bill through the House was the only way any major health overhaul bill could be signed into law after newly elected Scott Brown broke the Senate's filibuster-proof majority. We find, almost on a daily basis, more and more serious flaws in the legislation, ensnarling even the Congress. The Times writes: "In a new report, the Congressional Research Service says the law may have significant unintended consequences for the 'personal health insurance coverage' of senators, representatives and their staff members" who may lose 'their current coverage, in the Federal Employees Health Benefits Program, before any alternatives are available.'" "There is a God, and He has a sense of humour." "They did not even bother reading the bill — serves them right." "Maybe if they read the bill they would know what was in it that they were voting to pass!" "Ah the law of intended consequences." "Welcome to our world, members of Congress!" "I think it might be a good idea from time to time for all members of Congress to deal with the kinds of uncertainty that the rest of us face every day." "It seems appropriate Congress should be the first victim of this legislation." "wow. these comments are from nyt readers???" And this week, two surveys showed that public opposition to the health overhaul law is growing, with 58 percent favoring repeal. Only 12 percent in a recent FOX News poll said they believed the law should be implemented as it is. Audacity: We hear that lobbyists are showing up in the offices of Republican members of Congress this week asking them to sponsor amendments to fix the many, many problems in the health overhaul law that are causing significant distress to their clients. Rep. Paul Ryan said he is telling them, "Work with us to repeal it. Then we'll talk." Doctors' distress: I was in Huntsville, Alabama on Friday to speak at the annual meeting of the Medical Association of the State of Alabama, a wonderful group of physicians whose outgoing president, Dr. Jorge Alsip, invited me to the "rocket city." Here is the PowerPoint presentation I gave. Physicians in Alabama generally have smaller medical practices and will have an extremely hard time complying with the huge number of bureaucratic reporting and other regulatory requirements the overhaul law would impose. There is a sense of disbelief and shock at what this would do to their practices and to their ability to continue to focus on providing the best patient care. One physician called from the audience at the beginning of my talk: "Say it ain't so!" I wish I could, but I did say that this is far from being settled policy. There is a global move toward consumerism, driven by greater patient demand for information and more control over decisions. I believe democracy and progress will prevail. Physician Reps. Tom Price (R-GA) and Parker Griffith (R-AL), who represents the Huntsville area, also spoke and warned the doctors that the next step in government control over health care will be for doctors' medical licenses to be dependent upon accepting Medicare, Medicaid, and other publicly funded patients. And this week, Massachusetts threatened just that. Dr. Price encouraged doctors to engage their patients as allies by keeping them informed, and he was refreshingly optimistic about the ability of the system of checks and balances to redress this tremendous abuse of political power the health overhaul law represents. "The federal government may be able to tell physicians what it will pay for services in public programs, but it shouldn't tell you what you can charge," he said. And Dr. Griffith, who switched his registration to Republican a few months ago, said his sensible, mainstream ideas were completely rejected in the Democratic caucus that, he said, has a hard left ideological agenda. He said he is very concerned that patient-centered, private medical practice as we know it will be a thing of the past if this overhaul law isn't blocked. Repeal is possible: Rep. John Shadegg (R-AZ) spoke on a conference call for physician leaders that we jointly hosted with The Heritage Foundation last evening. He said there is a growing sense among his colleagues that repeal is indeed possible. An article by Adam Hume in National Review reinforces that perspective. Hume writes about the creation of the British National Health Service. I can't do his piece justice in a short summary, but he concludes that people are wrong who say we are doomed because, once an entitlement is in place, it never can be repealed. Hume says the massive overhaul plan may well fail because the ultra-partisan law imposes huge new taxes, provides benefits to relatively few, cuts existing services, and imposes expensive mandates on virtually everyone. The NHS never would have been possible with that kind of launch. Here's what's coming: Massachusetts is our canary in the coal mine for health reform. As a harbinger of things to come, here is a link to the form that all Massachusetts residents must file with their state income taxes to verify that they have health insurance. And this is a state form! Imagine how much more complicated it will be when the federal government does this with the unbelievable number of income categories, insurance requirements, subsidy levels, and other complexities in the health overhaul law! Legislation to regulation: In 1965, when Congress created Medicare and Medicaid, the bill was 137 pages long. When the Mayo Clinic counted the number of pages of regulations governing the two programs about 30 years later, they found 130,000 pages of rules they must comply with. Do the math: One THOUSAND pages of regulation for every page of legislation? How is implementation of this new overhaul law even possible? Testimony: I will be on Capitol Hill on Tuesday, testifying at a hearing on "Protection from Unjustified Premiums" before the Senate Committee on Health, Education, Labor and Pensions. Stay tuned. The health overhaul plan will take at least $569 billion out of the pockets of taxpayers and businesses over the next ten years through new and higher taxes and will make the problems of soaring health costs even worse, Turner writes. For example, the infamous "death tax" now has a new sibling: the $17 billion "breath tax." The new health overhaul law requires everyone in America who breathes to have health insurance by 2014; some will get subsidies, but most will have to pay a fine if they don't buy the insurance required by the federal government. The legislation also includes new taxes on investments, taxes on medical supplies, and taxes on drugs and health insurance. No wonder the more Americans hear about ObamaCare, the less they like it. Members of Congress are returning to Washington wondering what happened to President Obama's promise that he could convince a very skeptical public that his health overhaul plan is a good thing after all, Turner writes. Every day more facts emerge about the legislation Congress slammed through on a hyper-partisan vote: doctor shortages loom; costs continue to soar; and constitutional challenges continue. Over the coming years, those who voted for health overhaul will find themselves perpetually on the defense in explaining the cascade of problems it creates. The uninsured rolls will continue to swell, the huge tax increases will kill jobs and depress economic growth, seniors will start facing the consequences of Medicare Advantage cuts, deficits will continue to soar, and the quality of care will steadily get worse as doctors and hospitals become more responsive to bureaucrats than to patients. ObamaCare will be blamed. The hodgepodge of new taxes that have already or will soon take effect as a result of the health overhaul legislation may not all show up in income tax tables, but their huge cost is still very real, Dubay writes. This cost will become most apparent in lost wages and international competitiveness, and it reduces middle- and low-income families' wages just as surely as an income tax hike would. Many families that make far less than $250,000 a year have high-end health plans and will be subject to the excise tax. Further, the individual mandate amounts to a de facto tax on individuals who do not want to purchase insurance. A substantial number of heart doctors — about one in four — say they order medical tests that might not be needed out of fear of getting sued, according to a new study published in Circulation: Cardiovascular Quality and Outcomes, reports the Associated Press. Nearly 600 doctors were surveyed to determine how aggressively they treat their patients and whether non-medical issues have influenced their decisions to order invasive heart tests. About 24% said they had recommended the test in the previous year because they were worried about malpractice lawsuits. About 27% said they did it because they thought their colleagues would do the test. Using Medicare records, the researchers found that doctors with higher scores were more likely to be in the areas with higher spending overall or higher rates for a heart test, although the differences were small. The researchers suggest that targeting malpractice concerns could help reduce the regional differences. Miller responds to a January 2010 Health Affairs article comparing group and individual insurance markets, which contained methodological flaws in its choice of sample population, its definition of health insurance affordability, and its use of standard rates alone to analyze individual markets. When Roland McDevitt and colleagues examine apparent differences in "actuarial value" between the group and individual insurance markets, they mostly ask the wrong questions in the wrong way, which produces answers that are either predictable or irrelevant, writes Miller. Their approach fails to capture the differences in health status, risk selection, and consumption patterns between those covered in the individual and group markets. This approach also overlooks how the different scope, scale, and nature of insurance coverage provided in the respective markets affect the actual claims made and paid, as well as the level of negotiated provider prices. The assumptions and omissions embedded in their simplified model further stack the "affordability" deck in favor of the employer-group version of health insurance. The new federal health care law has raised the stakes for hospitals and schools already scrambling to train more doctors, writes The Wall Street Journal. At current graduation and training rates, the nation could face a shortage of as many as 150,000 doctors in the next 15 years, according to the Association of American Medical Colleges. That shortfall is predicted despite a push by teaching hospitals and medical schools to boost the number of U.S. doctors, which now totals about 954,000. The greatest demand will be for primary care physicians, who will have a larger role under the new law, coordinating care for each patient. The U.S. has 352,908 primary care doctors now, and the college association estimates that 45,000 more will be needed by 2020. But the number of medical school students entering family medicine fell more than a quarter between 2002 and 2007. A shortage of primary care doctors could mean more limited access to health care and longer wait times for patients. financial crisis, more Americans support free-market ideas than favor government intervention. It cannot therefore expect the instant but lasting popularity of the NHS. Repeal is not impossible. It may even be Obama's Waterloo. HSA members are more involved in their health care: They are two and half times more likely to use online tools and three times more likely to take a health assessment than their PPO counterparts. For full replacement HRA and HSA plans, employers saved $118 million per 10,000 members over five years. Members in Aetna HealthFund plans spent more on preventive care and accessed higher levels of screenings for breast and cervical cancer as compared to members in traditional PPO plans; visited the emergency room less than their PPO counterparts; used the prescription drugs necessary to treat chronic conditions such as diabetes and heart failure at rates similar to PPO members; and used generic drugs at higher rates than members in a PPO plan. Can Price Shopping Improve Health Care? There are many reasons health care costs are spiraling out of control, but the simplest one to understand is this: Nobody knows what anything costs, Kiviat writes. Providers get paid through a tangle of insurance company agreements and billing schedules that change from patient to patient. No wonder a hospital can sneak a $100 box of Kleenex onto your bill and the price of an MRI can range from a few hundred to a few thousand dollars. If you don't know what something costs, you can't know if it costs too much. For example, the cost of LASIK surgery has dropped 30% over a decade after inflation is taken into account. As doctors rushed to add the lucrative procedure, the market was flooded with price signals about how cheap the surgery could be. The result: even though people tended not to cross certain price bands, transparency still drove down prices through competition. When consumers have clear alternatives, posting prices works. Harvard Pilgrim, Fallon Still At Odds with Mass. Two of Massachusetts' big health insurers face stiff fines after they submitted to the state revised premium rates for individuals and small businesses that differed from what regulators ordered, The Boston Globe reports. Harvard Pilgrim Health Care and Fallon Community Health Plan submitted base rates lower than those rejected by the state Division of Insurance, but higher than the April 2009 rates the state ordered. Insurance Commissioner Joseph G. Murphy said both insurers failed to comply with a clear directive and would be notified within 24 hours about how they will be penalized. In a letter sent to insurers earlier this week, Murphy warned they would face fines of as much as $5,000 a day — plus another $1,000 for each consumer who was unable to buy insurance at approved rates from the insurers — if they did not comply with the directive to submit revised quotes using April 2009 base rates. Grace-Marie Turner will testify at this HELP Committee hearing in Room 430 of the Dirksen Senate Office Building. Priorities in Health: Can We Make Better Decisions? 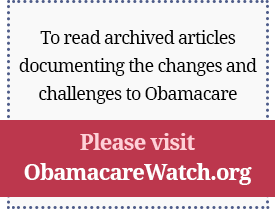 ObamaCare: Historic, but Is It Constitutional?